Fred Wilkinson next to the ceramic art featuring his band 'Toxik Ephex' and Carrie Reichardt. A mural honouring some of Aberdeen’s most beloved heroes is to be removed – because festival bosses did not get permission to put it up. The Everyday Heroes mural – made up of thousands of mosaic tiles – was installed at The Green as part of Nuart project in April. It celebrates some of the city’s most famous sons and daughters, from football legend Denis Law and Paralympian Neil Fachie to poet Sheena Blackhall and public health pioneer Mary Esslemont as well as some unsung heroes. But now the artwork will be removed from the wall of Kenny’s Music shop after the building’s owners, Esson Properties, complained that Nuart had not been given permission for the project. Nuart organisers last night pledged to find a new home for the mural, which was put together by London-based artist Carrie Reichardt and local school pupils. A spokesman said the mosaic tiles would be “carefully and sympathetically relocated” at a later date, and expanded over time. Paralympian and Commonwealth Games cyclist Mr Fachie said last night he hoped the mural – which will be painstakingly removed, tile by tile – would find a permananent home soon. Another of the everyday heroes featured is head teacher Caroline Thomson, who was nominated for inclusion by a former Cornhill Primary School Pupil. The mother-of-two from Portlethen, died of cancer in January 2016, and in the mural piece the pupil paid tribute to her kind words and generous nature. 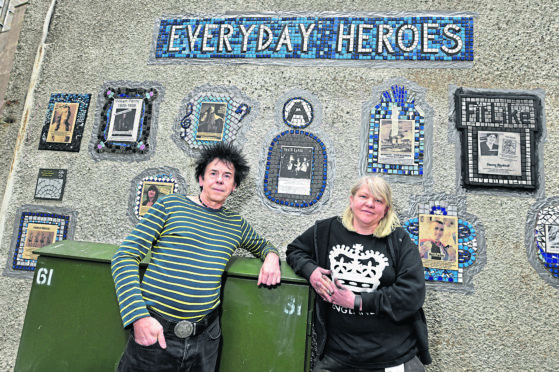 Mrs Thomson’s mother, Lorraine Gossip, said: “We were so pleased when Nuart contacted us to say Caroline had been included in the Everyday Heroes mural. “It was a last-minute surprise for us, on the day of the unveiling, and we have enjoyed seeing pictures of her friends visiting The Green to see it. “To now hear that the mural is to be removed is upsetting, and although we understand that planning rules must be followed it does seem a little insensitive of the building owner to insist it comes down. “Surely, the mural – along with the other Nuart creations – are helping to bring people to that part of the city, and its businesses. Artist Ms Reichardt said she would help to move the work to its new home, and added: “It’s a real shame that there was this oversight, but this happens a lot in these kind of situations. “I’m absolutely convinced we will get something sorted. A spokesman for Aberdeen Inspired, the city centre improvement group that worked with Aberdeen City Council to bring the festival to the city, said: “Aberdeen Inspired were made aware of this internal error with regards to not securing the necessary owner consent for Nuart Aberdeen’s Everyday Heroes installation, and have been working positively with the owners to come to a solution. Staff at Esson Properties did not respond to requests for comment.